A normal day for Eve in The Scraps: be a mecha-fighter in WarDome, run from the anti-technology brotherhood, find one of the most valuable androids ever built. 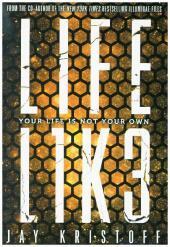 As soon as Evie, her android Crick and best(est) friend Lemon dig up the Lifel1k3 their lives get much more complicated than either of them had anticipated. I really liked this setting of a futuristic, dystopian, post-nuclear-war world. The surface of the Earth is scorched and partially irradiated. But to save her granddad, Evie must gather her squad and face more than just a few murderous androids, ruthless bounty hunters and betrayal left and right. Badass, full of action, running, explosions and superhuman fights! The second part (‘Dev1at3’) is going to be released in May 2019 and I am already looking forward to it!